Join us for our monthly community potluck prior to the soft opening of the Artisan Work Lab and the opening hours of the Whittier Free Store! The potluck will be from 12:00pm - 3:00pm in the downstairs courtyard area. Bring any dish or food item (if you are able) that you would like to share. 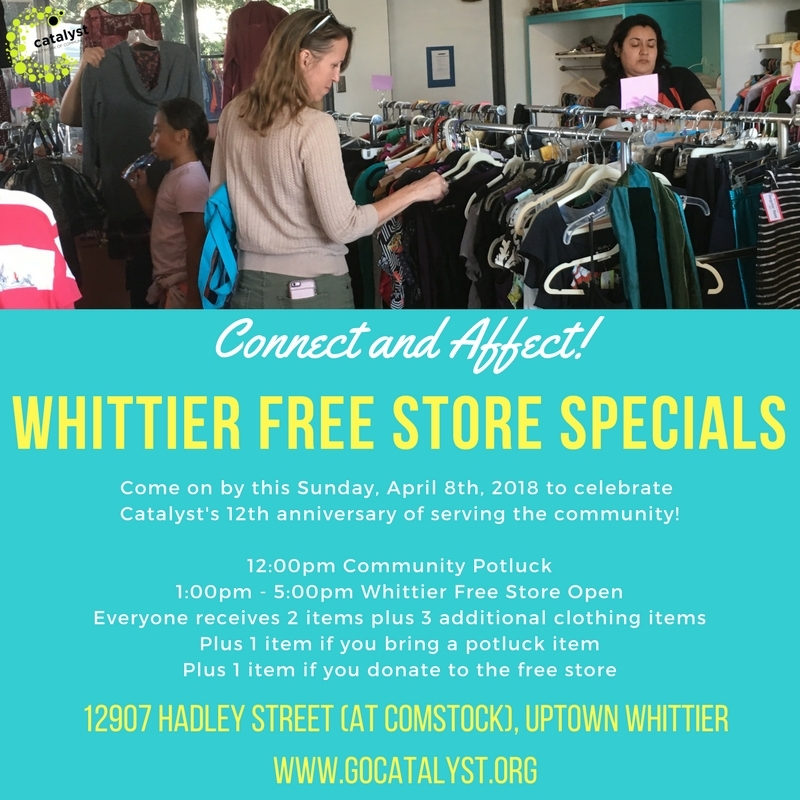 Meet the staff and volunteers for Catalyst and the Whittier Free Store. Meet other members of the community. Learn more about volunteer opportunities. The Artisan Work Lab will be open today from 1pm - 5pm for FREE PLAY. We’ll have supplies out for you to be creative and use your imagination! Everyone (with free membership) is welcome to shop the free store at no cost and may choose 2 items. Donating is not required in order to shop. If you bring in a donation, you may choose an extra item to receive. Supporting Members may also choose an additional item and can shop from the Supporting Members section. There is also an Unlimited Items area where everyone can choose to receive without limit. If you bring an item for the potluck, you may choose an extra item as well. Artisan Work Lab Volunteer Staff - require commitment to show up when scheduled, 12:30pm - 5:30pm shift on the 1st, 2nd, and/OR 3rd Sundays. These positions involve check-in and supervision of the makerspace. Learn how to convert an old t-shirt into a reusable tote bag. Learn about the impact of the fast fashion industry and how to reduce waste through upcycling. Jordan Salcido has always been passionate about shopping second hand first and reducing her consumption of new items as a way to reduce her carbon footprint. She grew up shopping in thrift stores and has taken it into her adult life and strives to live a concious and compassionate lifestyle. The Artisan Work Lab will be open today from 3pm - 5pm for FREE PLAY. Catayst is hosting a speech contest with cash prizes! Speech Topic: "Building Community Through Sharing"
**prize money will be given in the form of a check. We’ll have supplies out for xmas card making. This month, we've set out some special holiday and Christmas items as well as warm clothing for the winter season! Join us for the soft opening of the Artisan Work Lab! After nearly a year of clearing out and cleaning this room, we’ve transformed it into a makerspace for the community. We’ll have studio space for artists, crafters, and makers. We’ll also have a calendar of workshops. The soft opening starts at 1pm. Join us for our monthly community potluck prior to the opening hours of the Whittier Free Store! The potluck will be from 12:00pm - 3:00pm in the downstairs courtyard area. Bring any dish or food item (if you are able) that you would like to share. 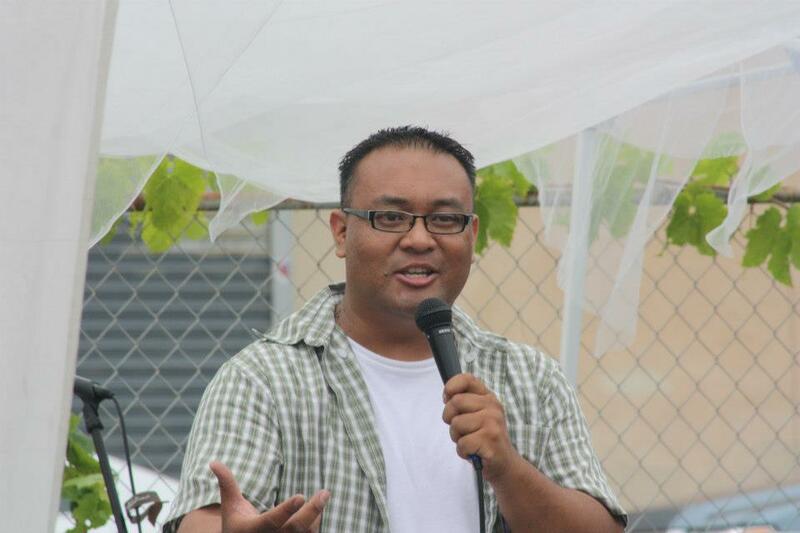 Meet the staff and volunteers for Catalyst and the Whittier Free Store. Meet other members of the community. Learn more about volunteer opportunities. The Artisan Work Lab is finally ready for artisans to come and see the space and provide input as to how you might personally like to use the space, how we can make it functional for community use, and the kinds of workshops/classes that you’d like to teach or participate in. Please come on by during the potluck! We are excited to celebrate the 12th anniversary of Catalyst Network of Communities! Established in April 2006 originally as Catalyst Long Beach, for the past 12 years we have worked to help create an environment that makes it easier for you to connect, collaborate, and share resources. Take a look at our History page here to see the impact we've had! The Whittier Free Store will be open from 1:00pm - 5:00pm. Everyone (with free membership) is welcome to shop the free store at no cost. Today's special: everyone receives 2 items plus 3 additional clothing items, plus 1 item if you bring a potluck item, plus 1 item if you donate to the free store. Supporting Members may also choose an additional item and can shop from the Supporting Members section. There is also an Unlimited Items area where everyone can choose to receive without limit. Become a member of the Whittier Free Store; membership is free and only involves a brief orientation to learn how we do things. Since the free store is located upstairs, we apologize that it is not accessible for individuals with certain disabilities. However, if you send email to freestore@gocatalyst.org in advance, we may be able to work with you to make other accommodations. Everyone (with free membership) is welcome to shop the free store at no cost and may choose 2 items. March 4th is an UNLIMITED CLOTHING DAY so that means all shoppers may choose any number of clothing items. Donating is not required in order to shop. If you bring in a donation, you may choose an extra item to receive. Supporting Members may also choose an additional item and can shop from the Supporting Members section. There is also an Unlimited Items area where everyone can choose to receive without limit. Join us for our first community potluck prior to the re-opening of the Whittier Free Store for 2018! The potluck will be from 12:00pm - 3:00pm in the downstairs courtyard area. Bring any dish or food item (if you are able) that you would like to share. Meet the staff and volunteers for Catalyst and the Whittier Free Store. Learn more about Catalyst.